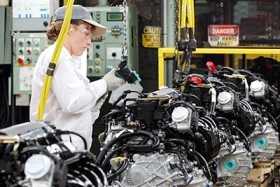 The investment follows other moves by Honda to bring parts of the Earth Dreams engine initiative to its Ohio plants. TRAVERSE CITY, Mich. -- Honda North America intends to invest another $180 million in its Anna, Ohio, engine plant to boost aluminum die-casting and engine parts production. Honda said today at the 2013 CAR Management Briefing Seminars here that the investment will support "engine parts production related to the new Honda Earth Dreams Technology engines and transmissions." Earth Dreams is Honda's umbrella classification for a new generation of more fuel-efficient high-output engines that range in size from 1.3 liters to 3.5 liters. The Earth Dreams concept was unveiled in late 2011. It includes gas and diesel engines, a hybrid engine system, a battery-powered electric drive system and a continuously variable transmission. The investment follows other moves to bring parts of the Earth Dreams initiative to Honda's Ohio plants, including a new direct-injection engine and the pulley components that are at the heart of the new CVT transmission. Honda also said it will invest $35 million to build a 160,000-square-foot office and technical training center in Marysville, Ohio. The offices will house both a heritage center, focused on Honda's history, and a support services company called Honda North America Services LLC, which Honda created in April to coordinate its North American sales and manufacturing arms. The new building will open in fall 2014. Also today, Bloomberg, citing sources it did not identify, reported that Honda plans to invest about $435 million to build a second factory in Brazil. The plant, about 124 miles northwest of Sao Paolo, will start production of compact cars in 2015, the sources said.